Many international forums have identified the need for comprehensive, scientific methods for the pre-release testing and post-release monitoring of transgenic plants to ensure their environmental safety and sustainable use. In response to this requirement, a GMO Guidelines Project was established under the aegis of the International Organization for Biological Control, to develop biosafety testing guidelines for transgenic plants. 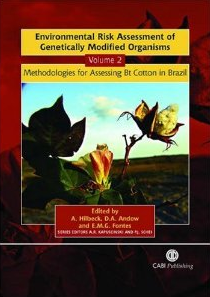 This second volume focuses on transgenic cotton in Brazil and addresses both environmental and agricultural impacts. It draws out some general risk assessment guidelines and demonstrates the need for case-by-case analysis. Publication Date: March 2006 Authors: A. Hilbeck and D.A. Andow This is a STAP Collaborative Publication Publication is available for purchase at CABI Bookshop and other popular online book retaliers.